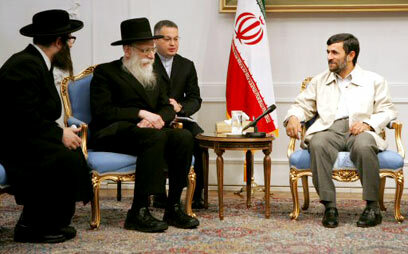 Iranian President Mahmoud Ahmadinejad met Thursday with Neturei Karta representatives who arrived at the Holocaust denial conference held in Tehran this week. The rabbis who took part in the meeting thanked the president for his "courageous stance against the Zionist regime's crimes" and thanked him for his support of the Jews. They told him that they "disagree with the Zionists' crimes in occupied Palestine." They also said that "the Jews' massacre in World War II served as an excuse for the Zionists and their supporters to establish the State of Israel." In photos taken by AFP, the Iranian president is seen shaking their hands and talking to some of them. In the Tehran conference, different "experts" expressed their doubts that the Holocaust took place. In a statement issued by the Iranian president's office at the end of the meeting, Ahmadinejad called on religious figures, scientists and researchers from the three religions to "establish a united front against the Zionists in order to prevent crimes against humanity." According to a report by the Iranian news agency IRNA, the Iranian president called on world powers and on the Zionists "to remove the fake Zionist regime as they established it, or to hold a referendum in order to determine the type of regime the Palestinians prefer, with the participation of all Palestinians – including Jews, Christians and Muslims." The Iranian president distinguished between the Zionists and the Jews, saying that "those who understand and seek justice will not be listed among the Jews responsible for the crimes of the Zionist regime in occupied Palestine, including the killing of defenseless women and children." According to the report, during the meeting the participants "also discussed ways to solve the Palestinian issue through a dialogue." Israel's Chief Rabbi Yonah Metzger on Wednesday night called on world rabbis to reject Neturei Karta members who participated in the Holocaust denial conference in Iran , saying they “sabotaged Israel” and should not be allowed entrance to Temples. “They betrayed the Jewish people and their heritage and particularly disgraced the Shoah and desecrated its memory. They tried to stain the Jewish people, who shy away from this low behavior, with their shameful behavior,” Metzger said. According to Jewish law, only a court with a panel of at least three rabbinical judges has the power to start a boycott. Rabbi Metzger’s spokesman Arik Eliovitz told Ynet that the rabbi had “made the call on his own with out other rabbis”. Israel Hirsch, a member of Neturei Karta living in the Meah Shaarim neighborhood of Jerusalem, who attended the conference explained, "The haredim who attended the conference for investigating the Holocaust in Iran share a common platform with Ahmadinejad when it comes to the so-called myth the Zionist movement created around the Holocaust. "They wanted to make it clear in Tehran that Zionism uses the Holocaust as an excuse for the existence of the Zionist state in the Land of Israel," he said. Hirsch continued, "Because the UN agreed to establish a state because of the Holocaust, the Iranians are claiming something very logical. They aren't saying that there wasn't a Holocaust, but who perpetrated the Holocaust? The Nazis, the Germans. So they should at least pay compensation to the Jewish nation and establish a Jewish state within Germany and not within the land of Israel, which belongs to the Palestinians." Israel’s former chief rabbi, current Tel Aviv Chief Rabbi Yisrael Meir Lau did not buy the explanations of the Jews who attended the conference. “It is something completely insane. If it’s possible that there is any Jew, who for some reason or another can support a Holocaust denier in a generation where people with numbers tattooed on their arms are still among us – it’s an insanity that has no justification and no explanation,” he concluded. See all talkbacks "Ahmadinejad, Neturei Karta: Zionists are criminals "